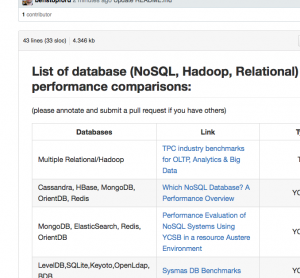 I did some research at the end of last year looking at the relative performance of different types of databases: key value, Hadoop, NoSQL, relational. I’ve started a collaborative list of the various benchmarks I came across. There are many! Checkout below and contribute if you know of any more (link). Add the numbers ( 11 + 8 ) and SUBTRACT two ?